Like Giada cooks with Aunt Raffy and Ina cooks with the chef at Nick & Toni’s, today my good friend Ashley is joining me to pass along one of her recent recipe adaptations for an easy weeknight meal. Thank you for sharing with us – I can’t wait to see what you cook next! On Sunday afternoon, while my boyfriend was watching the Mets game, I decided to peruse my recently unpacked cookbooks (we just moved and they were in the very last box) to see what jumped out at me to cook this week. As I was flipping the pages through Giada’s Kitchen, I saw a dish using salmon and peas (both of which I had in my freezer) — it looked easy enough to make, so I marked the page and called it a day. My biggest thing when I cook is ease… so the fact that I had 90% of the ingredients for this recipe already in my kitchen, and the process was fairly simple, made it a slam dunk. I forgot to buy mint, so instead I used chives that I had in the fridge. It totally worked fine, and probably was just a milder flavor than with the mint. I’d use chives again in a heart beat. I also didn’t buy lemons or garlic since we keep a bottle of lemon juice and chopped garlic in the fridge at all times (I know most people would be disappointed by this, but we cook almost every night with these ingredients, so it really just makes the most sense both money and time wise.). When I defrosted the frozen peas, they were still cold. 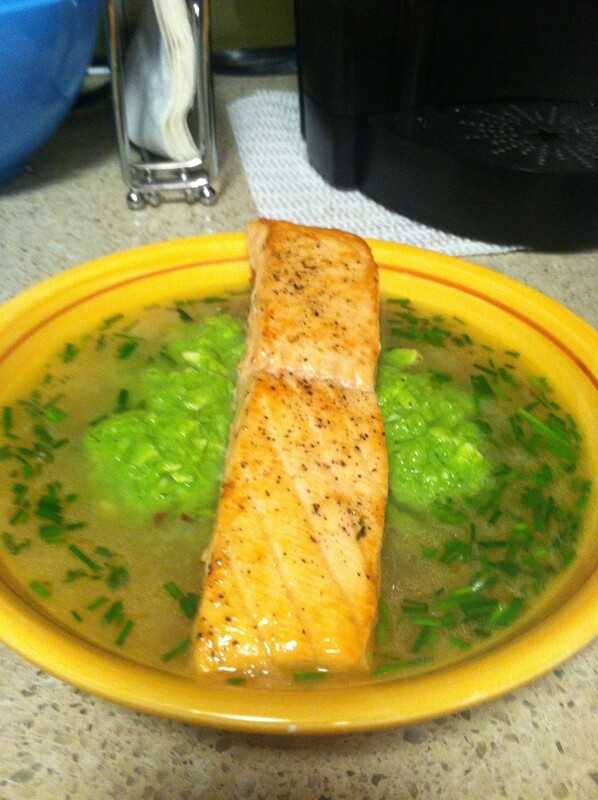 While the pea puree was still delicious, it was a little weird to have a warm broth and salmon, and cold pea puree. I would heat it a little for next time. I don’t have a blender, so I used an immersion hand blender for the pea puree. It worked perfectly, but you have to go in short spurts as to not splatter. I’d highly recommend this recipe, and will definitely make it again. Frankly, I’m not sure it needed the brodetto, but it was tasty! The pea puree had a pesto-type flavor in a guacamole consistency… so I’d make this again with salmon (or any other fish) and even chicken too. I’m going to make this dish in the next week. WIll let you know how it turns out!